ABAP programmer can use ABAP function module SAP_WAPI_READ_CONTAINER to display and read SAP workflow task container contents which are stored as element-value pairs. In this ABAP tutorial, I tried to share sample ABAP codes which can help the developers to use for reading SAP workflow container data. ABAP programmers can use standart ABAP function module SAP_WAPI_READ_CONTAINER to read the contents of a SAP workflow task container data. 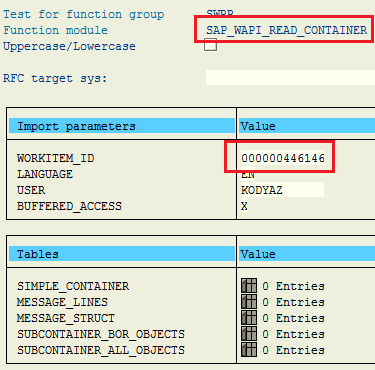 To see how SAP_WAPI_READ_CONTAINER ABAP function module works, let's use a sample work item id. 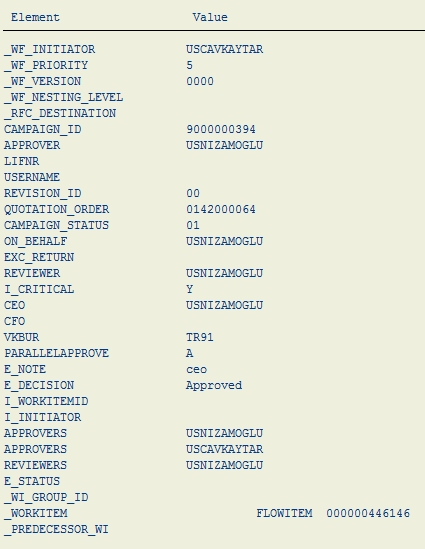 Perhaps before you call SE37 tcode, first call SWIA transaction code (Process Work Item as Administrator) and execute the report and select a sample Work Item ID from the list. Now we are ready to execute SE37 tcode and paste the function module "SAP_WAPI_READ_CONTAINER" in the FM name input text. Run the function module. Then provide the work item id as the marked WORKITEM_ID import parameter value. After you execute the SAP_WAPI_READ_CONTAINER function module, as seen in below screenshot SIMPLE_CONTAINER Table parameter can be used to display the contents of the workitem container data. When ABAP programmer clicks on Simple_Container table parameter, as seen in below image the workflow container data is listed as element value pairs. If you want to develop an ABAP program which reads workflow container data using SAP_WAPI_READ_CONTAINER function module, you can use following ABAP code sample as a starting point for your report. DATA gt_simple_container TYPE TABLE OF swr_cont. DATA h1(25) TYPE c VALUE ' Element'. DATA h2(50) TYPE c VALUE ' Value'. IF gt_simple_container IS NOT INITIAL. LOOP AT gt_simple_container INTO DATA(gs_simple_container). Above ABAP program will list all element-value pairs stored in the workflow container content. If you work on a specific workflow task, it is possible that you already know the element names of the ABAP workflow container data. 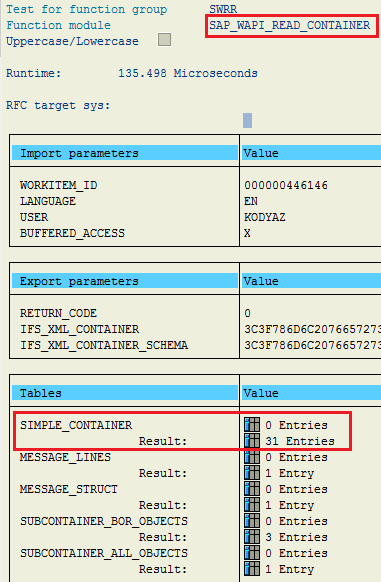 If the ABAP programmer is dealing with specific container data of a SAP workflow task, you can directly READ related element from the Simple_Container table parameter. READ TABLE gt_simple_container REFERENCE INTO DATA(lr_simple_container) WITH KEY element = 'CAMPAIGN_ID'. WRITE: 'Campaign ID', lr_simple_container->value . READ TABLE gt_simple_container REFERENCE INTO lr_simple_container WITH KEY element = 'VKBUR'. WRITE: 'Sales Office', lr_simple_container->value . READ TABLE gt_simple_container REFERENCE INTO lr_simple_container WITH KEY element = 'E_DECISION'. Here is the output of the simple ABAP report which displays specific element values from a SAP Workflow task container. 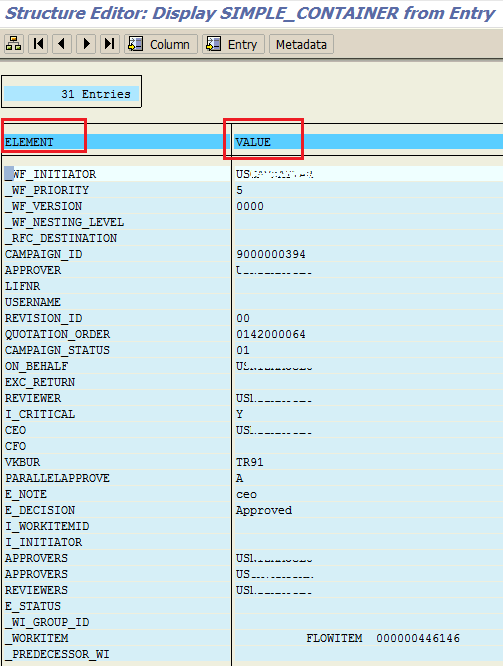 Above ABAP codes work for a given specific SAP Workflow task id. If you need to display data for a given task (like TS90900107, etc) in a defined period the programmer has to loop in the list of work items and call above code block. Of course for a better look-and-feel the workflow container data should be stored in an internal table and the result could be displayed on an ALV grid for a table display. DATA header1(25) TYPE c VALUE 'WorkItem ID'. DATA header2(25) TYPE c VALUE 'Campaign ID'. data s_taskid like swwwihead-wi_rh_task VALUE 'TS90900107'. IF lt_swwwihead IS NOT INITIAL. LOOP AT lt_swwwihead REFERENCE INTO DATA(lr_swwwihead).